Looking for a new Photoshop system? 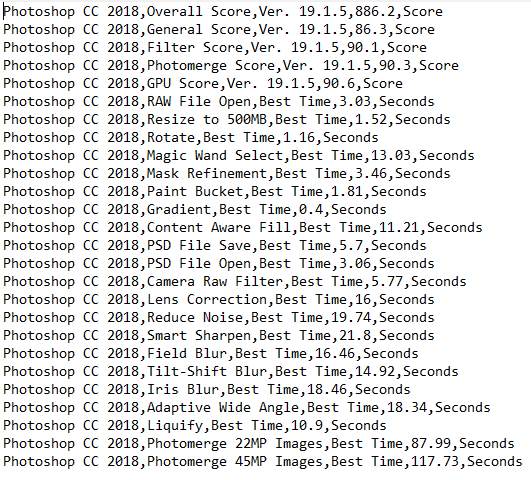 Version 18.10 now available with support for Photoshop CC 2019! At Puget Systems, one of our primary goals is to make sure that our customers end up with a fast, reliable workstation that is perfectly tailored to their unique workflow. 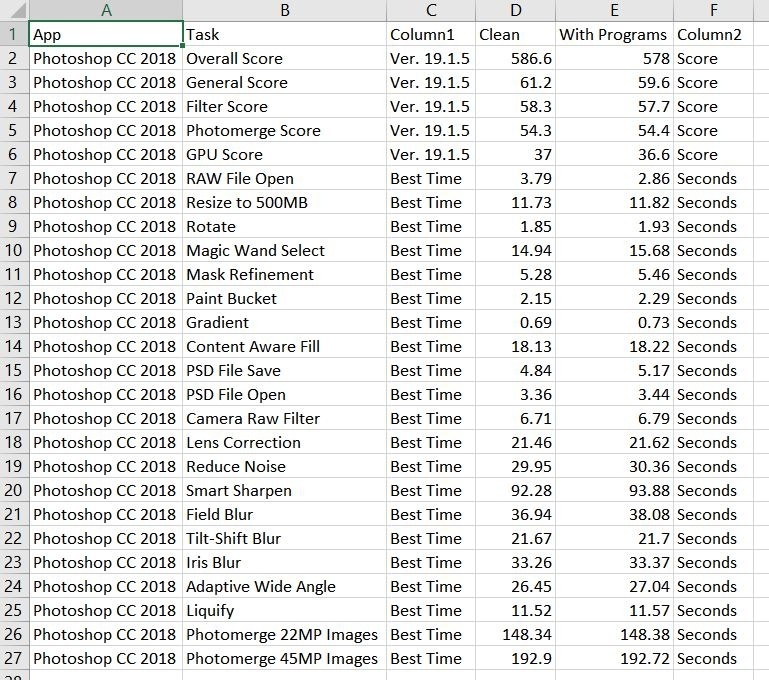 The main way we do this is by benchmarking a wide range of hardware in Photoshop that we then publish in our ongoing series of Photoshop hardware articles. However, while this ensures we are selling the right hardware, it does not give our customers a great idea of how much faster a new workstation would be compared to their existing system. To address this issue, we are - for the first time - making our internal benchmark available for public download so that anyone can compare their own computer to the latest hardware currently available. Even better, this benchmark is compatible with both Windows and Mac-based systems! 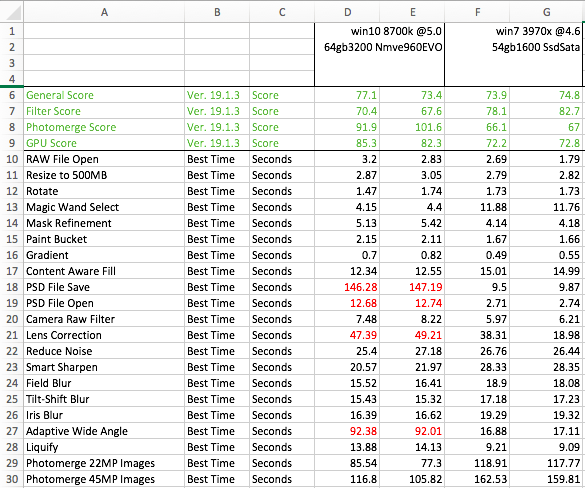 Note that scores are NOT interchangeable between version 18.10 and older versions of our Photoshop benchmark. If you wish to run the 18.4 version, you can download it here. After downloading the benchmark, unzip it to a convenient location - we recommend placing it on the same drive that you store active projects as opening and saving files is a part of the benchmark. Before running the benchmark, we highly recommend resetting Photoshop to it's default settings as changes in color space, bit depth, etc. can drastically alter the final results. Information on how to reset the preferences (and how to back up your current settings) can be found in the Photoshop User Guide - Workspace - Preferences. If you are on a PC using Windows, run either the Windows_Basic.exe or Windows_Extended.exe to launch the benchmark. For MacOS, run either MacOS_Basic.app or MacOS_Extended.app files. If you have Photoshop installed in a non-default location or otherwise have issues with the benchmark, launch Photoshop manually then go to "File -> Scripts -> Browse". Navigate to the location of the benchmark folder and select either the "PugetBenchmark_Basic.jsxbin" or "PugetBenchmark_Extended.jsxbin" script. Each individual task is run a total of three times with the fastest result being used to tally the final score. A full run should take approximately 20-45 minutes but will vary based on the performance of your system. When the benchmark is complete, it will give you an "Overall Score" as well as individual scores for the different types of tests. A log file is generated in the benchmark folder that includes these scores as well as the time in seconds it took to complete each individual task. 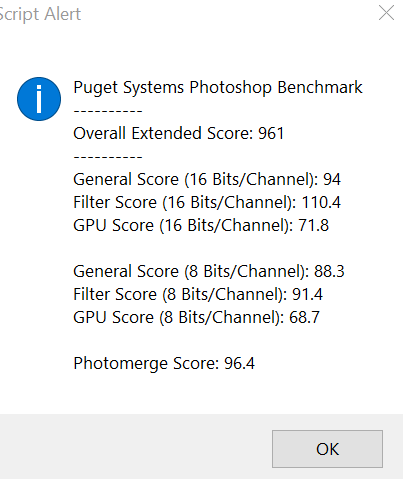 This benchmark is designed for Photoshop 2019 and should run on virtually any OpenCL-enabled Windows or Mac-based system that has Photoshop CC 2019 installed. However, due to the size of the test projects it is ideal to have more than 24GB of system RAM for the normal (8 Bits/Channel) benchmark and 32GB for the extended (16 Bits/Channel) version. The benchmark should be able to complete with smaller amounts of RAM, but the Extended test in particular is likely to receive a lower than normal score. If you have a GPU with less than 4GB of VRAM, we recommend only running the normal benchmark as the extended version is likely to give out of memory errors when running some of the benchmark tasks. Note that this benchmark currently requires the language used in Photoshop to be English. This benchmark is still in BETA Plug-ins and customized preferences in particular may prevent the benchmark from running properly. There is also a dedicated GPU Score that is the average of the results for the Rotate, Smart Sharpen, Field Blur, Tilt-Shift Blur, and Iris Blur which are the five tasks that make the most use of the video card. Scores are not directly comparable to the scores from previous versions of this benchmark. Will you be adding the the Ryzen 2700 and 2700X to your benchmarks? Thank you for this tool for easy comparison. Can't wait to test my machine, it's very similar to your specs ;) it's cool to run such benchmark on older computers to see what actual gain one may get by updating your machine. This was the older version of this test, but i make it again with newer PS. I buy a new PC and will check the difference. where you able to achieve a higher score than this with your older system? I am trying to help someone diagnose lag in photoshop when doing somehting as simple as using large brushes on a 4000x4000 canvas area on an intel xeon x3 1231 processor. 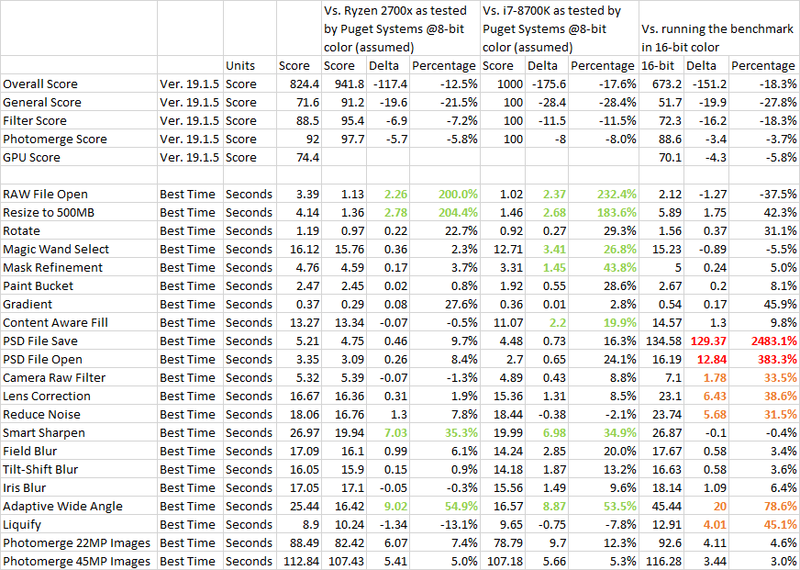 LR & PS are super-fast compared to previous PC config. Im pretty much 100% photoshop user myself. How is the power consumption of the new rig compared to old one? should i move to nvidia or 4600 enough for photoshop !! In the latest GPU testing we did https://www.pugetsystems.co... we saw about a 60% increase in performance going from the Intel HD 630 graphics on an i9 9900K to even a GTX 1060. Your 4600HD graphics is quite a bit older than that , so my guess is that you will see at least a doubling of performance with GPU-based effects/actions if you can get even a low/mid-range NVIDIA GPU. strangely, with the system overclocked to 3.9 Ghz, the result was inferior to the analyze in default. Am I right in thinking that your reference system has an overall score of 1000? Would be good to see your best scores in the same log format. Yep, that is correct. I would like to get up a number of "example scores" at some point, but for the moment I at least added the scores for the reference system in the "How does the scoring work?" section. Hi. I´m trying it right now and the script stops to say the command select is not currently. Any idea why? Does it affect the benchmark? Also It has stopped and aborted when saving because the file exceed 2gb and can not save as psd. This benchmark is very much a beta at the moment, so it isn't surprising that there are a few issues. Do you have any plugins installed, have PS or the OS set to non-English, or anything else non-default? Yeah. OS and PS are Spanish. Yea, that would do it. Not sure what the best solution might be since we are primarily utilizing the Action functionality built into Photoshop. There is an action file in there that you could open, find anything that might be broken, fix them, then save and replace the original action script if you wanted to try that. Just a warning on that though, I'm pretty sure there is a bunch of unused actions left in there that I ended up not using for one reason or another. So not everything needs to be changed. Long-term, I'm not sure what the solution to this would be. 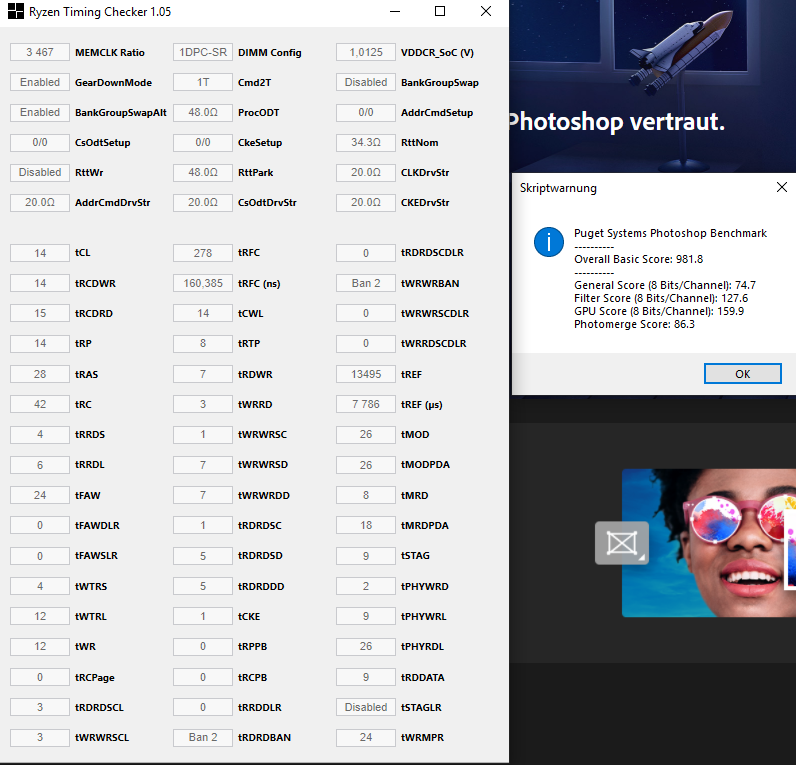 It looks like to change the language in PS requires you to change a setting in Creative Cloud, then reinstall Photoshop. https://helpx.adobe.com/cre... . Not ideal, but doing that twice (once to switch to English, a second time to switch to Spanish) might be less work than trying to update the action script. Thanks for reporting this issue. I'll add a bit of a warning to this page to mention language. I´m not getting all the scores like other people. 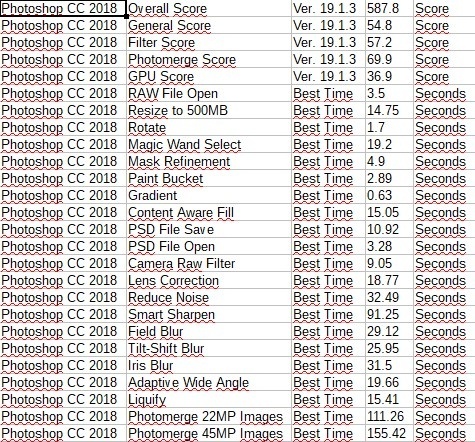 At the end it only show Overall, General, Filter, Photomerge and Gpu scores. The rest of the results are the raw time it took to finish each individual task in seconds. The scores are calculated based on those times, but if you want to see those as well you just need to open the log file that was written in the benchmark folder. Many scores are suboptimal comparing with my other 3970x 64gb 1050ti machine and other people scores but look at psd open/save and adaptive wide angle... WTF is going on here? Not having the the OS ssd could have that impact? Meltdown/spectre patches can have any relation? Something is definitely not right, but its hard to say whether the benchmark is off or something is wrong with your system. My guess is that even with you changing the language to English there is still something breaking mid-benchmark. Either that or you have a major performance issue with your hard drive. You could try running something like CrystalDiskMark ( https://crystalmark.info/en... ) to benchmark the drive to make sure you are getting the ~3,200 MB/sec read and ~1,900 MB/sec write that drive is rated for. The benchmark saves the PSD file to wherever the benchmark folder is, so also make sure you don't have it on a secondary drive if you have one. You could also try turning off your overclock to see what happens. An overclock could appear to be stable, but actually causing the system to throttle in some cases resulting in lower performance than the system would be with stock settings. I opened and saved manually the temp psd in the folder (1.99gb) and gave me the similar results. 13 sec open, 100 saving. So the benchmark seems to be ok. In case it means something when saving it goes all the way to 25% then it stops and continues really slow. OC seems to be very stable with no throttling during the benchmark (and during other heavier tasks). Just in case I run the default Bios settings but same save timings. Odd and frustrating. Must be something in my system and I can´t figure out what. I´ve done a new windows instalation. No win/bios updates. Instaled only PS and a couple of temps/performance monitoring apps. As somebody pointed out, you must have run the benchmark in 16-bit color mode (as how most of us actually use Photoshop anyways). Quite fortuitous, since I posted my benchmark numbers in both 8-bit and 16-bit color modes below. 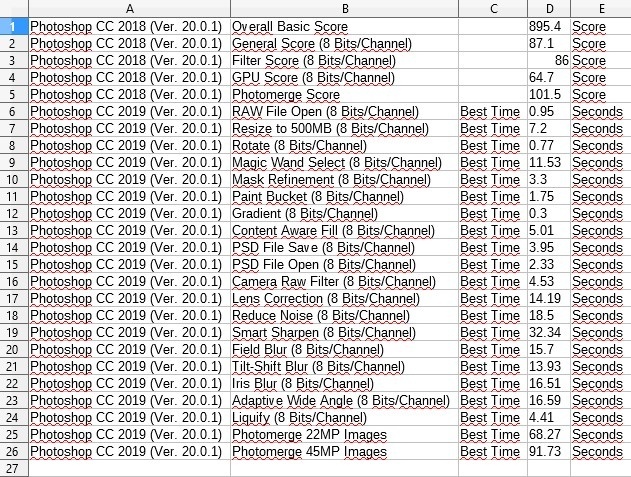 Thought you would be interested, I just updated the benchmark to work with PS CC 2019, but also added an "Extended" mode that tests both 8 Bits/Channel and 16 Bits/Channel. So there shouldn't be any issues with someone having PS set to either color depth anymore. It also forces RGB Color just in case someone is in a different color mode usually. Specs: i5-8400, GTX 1050, 16GB DDR4-2666, 250GB 860 Evo. Just quickly comparing it to the R5 1600 system posted earlier, it seems this one is marginally faster in many cases but gets absolutely slaughtered in a few (Smart Sharpen, Content Fill Aware) where I guess the Ryzen CPU's SMT really helps. Thanks so much for making this available, cheers guys! I used a MSI Z270 XPower Titanium MB and Noctua NH-D15S cooler (I originally wanted to use the NH-D15 but it wouldn't clear my graphics card). This system posted a Passmark system rating of 8821 when it was fresh (over a year ago) and was #5 on the top 20, but newer systems have pushed it off the top 20 since then. New result with a fresh Win installation. 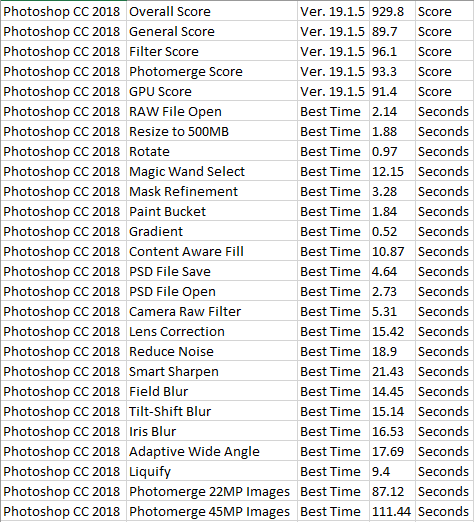 Any idea why the Photomerge 45MP images completed faster than the 22MP images? That sounds like maybe a bug in the test. In your test results the 45MP Photomerge took less time than the 22MP Photomerge. I think you posted that your last best results with the same computer were around 66.12/95.5 seconds. And, all other benchmarks have the 45MP image test taking longer than the 22MP test, so I am guessing there might have been an error someplace. Since the 45MP test is the last test maybe the test exited prematurely for some reason? Sorry for the delay. No idea, perhaps a bug in that single test. If it is a bug, then I think that the score for that particular run is probably invalid. It just doesn't make sense that the larger images would take less time to process than smaller images in the Photomerge benchmark. Thanks for the results. I think I'll have to reinstall my 2+ years old Win 10, just to see what would be the score! only lead to 1035 score. Values are similar but you have 2X the Photomerge score. Two tests: one freshly rebooted, and one with Lightroom open and Spotify playing. So noob question here: does this mean I could be getting twice the speed/performance with the benchmark system? Not quite twice the performance since your system was closer to 60% the speed of the reference system, but it should work out to be about a 1.7x increase. Hi Matt! Thanks for creating this benchmark. It worked really well and helped me fine tune my system without spending any money. I found something interesting. This benchmark is dependent from Camera RAW workflow options! More specifically from Color Space - Bit Depth. If you set 8-bit depth, benchmark is running on 8-bit test image. But set 16-bit in Camera RAW and benchmark starts working in 16-bit mode. Results obtained first time by 'El Perro' (long times reading, writing etc.) wasn't improper, they was fine, but obtained in 16-bit mode i suppose. He mentioned about almost 2 GB psd bnechmark temp file. In 8-bit mode this file is more then 2 times smaller. That makes sense. 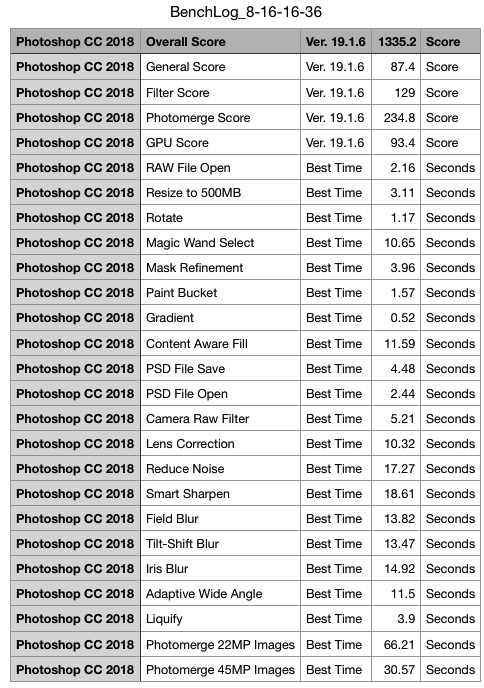 I think we might need to backup the Photoshop preferences, reset them to default, run the benchmark, then reload the original preferences. I really didn't want to do that since there is always the chance of something going wrong and the original preferences getting deleted, but it sounds like we might need to. Thanks for the heads up on your findings. I'll make that change the next time I update the benchmark. I think that this settings is beyond Photoshop preferences, this is Camera RAW settings. I've deleted preferences at start (ctrl-alt-shift) and camera RAW was untouched. Maybe instead of messing up with preferences, easier way is try to change test image from cr2 to tiff with proper bit depth. Or if You have to stay with camera RAW image simply add one more command to the testing script: convert image to 8-bit, right after reading raw file and before rest of the test. Sorry for language mistakes, English isn't my native language. My results was 612, (all sub-scores very close to 60) probably about right for my "Windows experience index" of 7.7 with 32GB, stock 4770K, SSD for OS, and Nvidia GTX 970. 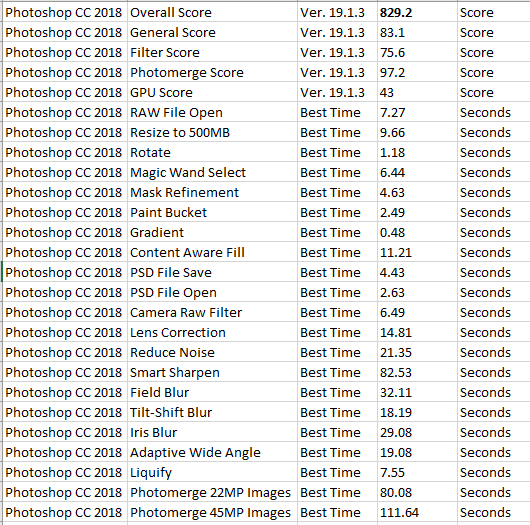 I started up Lightroom, a real memory hog, and expected these scores to drop, simulating the memory effect, but the differences were minimal. My questions to Puget: With your test system, you could test with 32GB of memory, and show the effect of the extra/less memory alone? In addition, if you have a four core system with 32GB, that could approximate the more/less core effect, since your test system is 6 core? In particular, my current plans are for my next system to have 128GB of memory and 6-8 cores. 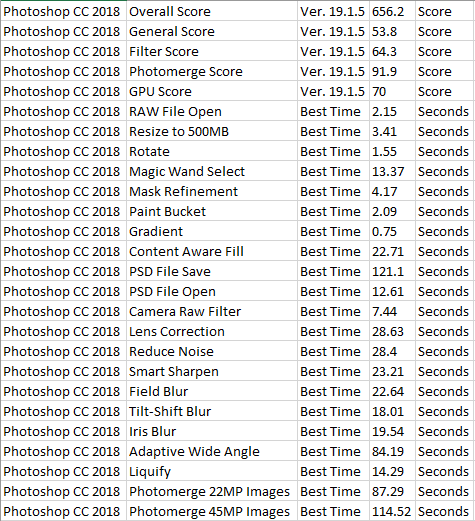 I think this is trivial for Photoshop, but the specs on the newer M2 drives vs the SSD drive in your test system for the OS show gigantic speed improvements and one wonders how this translates into these benchmarks. I want to thank Puget for undertaking this really great effort to help users figure out what is important in new hardware systems. Such steps above and beyond are what causes customer loyalty and economically beneficial stickiness with repeat purchases. Quite impressive in an industry composed of stock components. Failed to complete the test for two days and 4 new downloads until I figured out that ZIP extractor was showing 100% decompression but would not complete. Hence, only one of the 45MB panos downloaded and the bin script failed with a "Photomerge needs at least 2...." Switched to Cloud convert and test worked straightforwardly. In general, more instructions about "after the download" would be helpful. Google Drive is also a POS regarding ease of use. Reading through all the responses, it certainly seems close to clear that, as has been the case, the dominant variable is frequency, thus the payoff from overclocking. Not cores, not memory (very much). 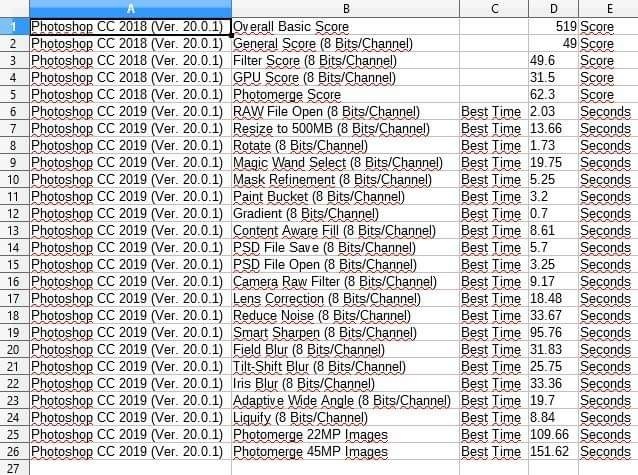 It would be interesting if someone did a simple excel regression of the data in these responses for benchmark score (Y), with frequency (X1), cores (X2), memory (X3), and perhaps graphics card memory (X4). My bet is that frequency will show as explaining almost over 75% of the differences in benchmark score. Even with such a relatively small sample. It is a myth that you always need really large samples for regression analysis. Definitely look through our published articles if you haven't already: https://www.pugetsystems.co... . Most of them are from before we published this benchmark, but the methodology was almost identical - just slightly different tests. If I had to rate the different aspects of the CPU in terms of importance, I would put frequency and architecture right at the top. Frequency is pretty obvious since most taks in PS are single or lightly threaded, but each generation older the CPU is tends to drop performance by about 10% (at least for Intel CPUs). So even though the latest CPUs aren't much higher frequency, they can still be significantly faster. Core count can help in some areas with content aware fill being the one we get the most customers asking about. But in general, core count is definitely secondary to frequency/architecture. Memory is typcially only a consideration if you don't have enough since in the testing we've done memory speed doesn't make much of a difference. Same with GPU - you need enough VRAM for what you are doing, but for performance once you get to a mid-range GPU going higher doesn't help from what we've seen. Pretty damn happy with this setup. So here's my personal Ryzen 2700x build. -> Less RAM, but running at a higher frequency. For the most part, I'm ignoring the black-box scores ("overall" and "general"), as we don't know the weighting of each contributing component. Likewise but to a lesser extent, the category scores ("filter", "photomerge" and "GPU"). Color-coded differences are things I might notice in actual use. This is to say that I won't really notice a fractional-second difference no matter what percentage of difference it might be. At the same time, not even noticeable differences will matter the same, as you might only do the given thing once per PP session per photo. YMMV, obviously. As such, I am happy with my system, especially given 1) it is tailored for my needs, with features (i.e. increased data availability/security, I also back-up off-site) and compromises (notably data access/write speed) of my choosing, and 2) with only the GPU and power supply carried over from a prior build, the total cost for all the new parts to bring my system up-to-date came out to just shy of $1.5k (July 2018 prices). And there's room to add more RAM should that be desired, or update the GPU. Trying to discern what are the primary bottlenecks (CPU, RAM, GPU, storage, etc.) in each of these tests. Also, your GPU score seems anomalously low. The reference system with the same GPU is defined as 100 points. 32GB RAM. Yea, I may need to re-run that test. my GPU is top notch and water cooled. Need a Mac Version of this benchmark. I could write that applescript for you, to be honest. Shoot, I'll do it. This works on Mac - there are instructions in the "How to run the benchmark" section. Thought I would throw in my score as a general reference for others with a similar setup. Not sure why my general score is so low but it is what it is. I could probably OC my RAM for a small gain in performance from the cpu (considering how sensitive the 2700x is to RAM speed) but I don't want to take the time. I undervolted the chip because it actually raised its performance due to lower temps. I tested this extensively using five different benchmarking tools and No Man's Sky. 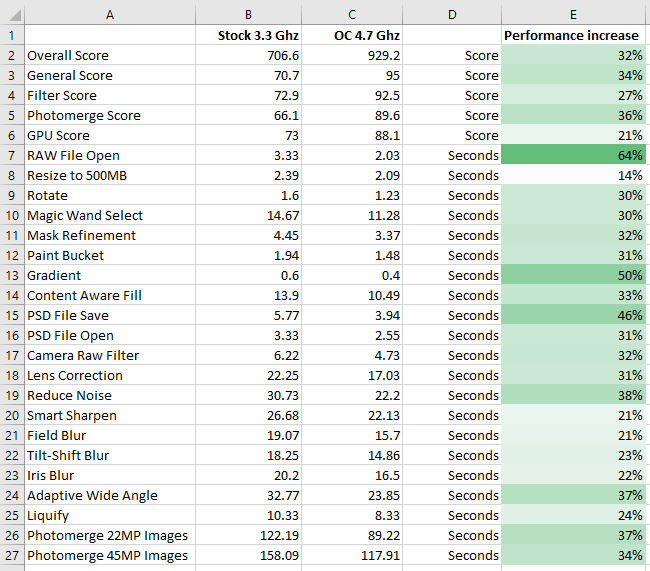 Ok after looking over other posted tests, it looks like my open and save times are excessively low for a m.2 drive. So there's that. Also I'm wondering if scratch disk settings have been taken into account? Not sure if that would have any bearing on the results or not but I'm going to designate a scratch drive and rerun the benchmark. As for the open and save times. I'm not sure how to figure that one out. I did notice I was unable to complete the storage benchmarks using User Benchmark recently due to a sequential write not completed error. I then tested all my drives and they all checked out, so I'm not sure what is going on there. Well I figured out I was running the benchmark off of my ssd and not the m.2 which changed the open/save scores. Here is the updated score. Thanks again for this benchmark! Does 960 Evo vs 970 Pro and the video card make that much difference for General and Overall scores? Only getting 923 and 82.5 for Overall and General at stock speeds. Getting 993 and 89.5 at 4.8 Ghz. According to AS SSD I'm getting 1800/2500Mb/s write and read on the Evo. Tried running it from the MX500 and got slightly lower numbers. Temps never go above 70C during benchmark. 2) I am noticing that the deltas between the 8-bit and 16-bit workflows between different system architectures (i.e. Intel and AMD) seem to indicate that they are impacted quite differently, specifically that Intel systems seem to take a bigger percentage hit in the scores. Puget systems/Matt Bach, can you run your reference systems in 16-bit mode and provide those benchmarks as well? Thank you, Matt, for providing this test. I'm posting my results, which seem pretty good, but will ask for advice at the bottom. Two questions for the most tech savvy here. And FYI, I'm a pro stills imager, regularly processing 45MP files in LR Classic CC and editing layered files in PS which grow to 2-3gb. 1) Will upgrading to 64gb (2 more 16gb sticks) increase my processing speed significantly-->20% say? 2) Will switching to EVO 970 (Pro) NVME drives speed things up measurably as well? I find that I'm waiting nearly a minute sometimes for PS to save in background while I continue editing if I start to reach the maximum of history states. I know the 1TB 970 Pro drives are the fastest, but perhaps at most 10% faster than my 960s. 1) More RAM only helps if you are running out of it already. I believe the default is to allow Photoshop to use 70% of your RAM (can be tweaked in Preferences->Performance). I would have task manager up while you are working and just check to see how much RAM Photoshop itself is using. If it is close to that 70% of maximum RAM then adding more RAM should improve performance. How much depends on how far "over" Photoshop is going on RAM usage and what kind of data it is having to throw out to stay within your RAM capacity. 2) Most likely moving up to a 970 Pro won't do anything. Most of saving and opening files in PS is actually limited by the CPU once you get up to a standard SSD. One thing you could do is to look at the size of the final Photoshop file and compare it to the speed of your drive to estimate how much time is actually spent on writing the file versus the CPU compute time. For example, the 960 EVO 500GB can write at 1,800 MB/sec while the 970 Pro is 2,300 MB/s. If you have a 2GB Photoshop file, it takes the 960 EVO about 1.1 seconds to do just write the file while the 970 Pro is ~.9 seconds. This isn't a perfect method since there are many other factors in play, but if it is taking a minute to save a file that is roughly that size I highly doubt a faster storage drive is going to make more than a second or two difference. Matt, thank you so much for your detailed, thoughtful reply. I will have to carefully monitor my PS RAM and scratch disk usage. I suspect that part of the slowness is due to having 4-5 2gb PSD layered files at one time. That may "waste" PS cache and therefore RAM. Having a few files open is usually necessary because I'm copying adjustment layers between PSDs and comparing images. Another possible way to speed things up is to just upgrade to 64gb RAM and create a temporary RAM drive (~24gtb) to store the working images on temporarily. Any thoughts on whether that would work? I don't think using a RAM drive will really help all that much. You could try it, but my bet is that simply having that RAM available as... RAM... will give you better overall performance. Thanks to Puget Systems for publishing their knowledge. Open source is appreciated. In Australia Puget won't deliver their systems as they can't provide the support they insist on. Remarkable integrity. I was also running a few other apps and an RDP session so I could continue working on my day job. I didn't set embedded profile which may explain the low General Score?? eg waiting for me to click buttons. Anyway, this system was based on your publicly available advice (with a mild OC - no temp was >71c). Thank you for making you knowledge publicly available. Looks like my X5650 @ 4.3 is showing its age. Time for a new build...2700x, 2950x or intel 7900x for Photoshop with lots of plugins, some Premier 4k editing and gaming (VR Oculus mainly)....what you guys think? 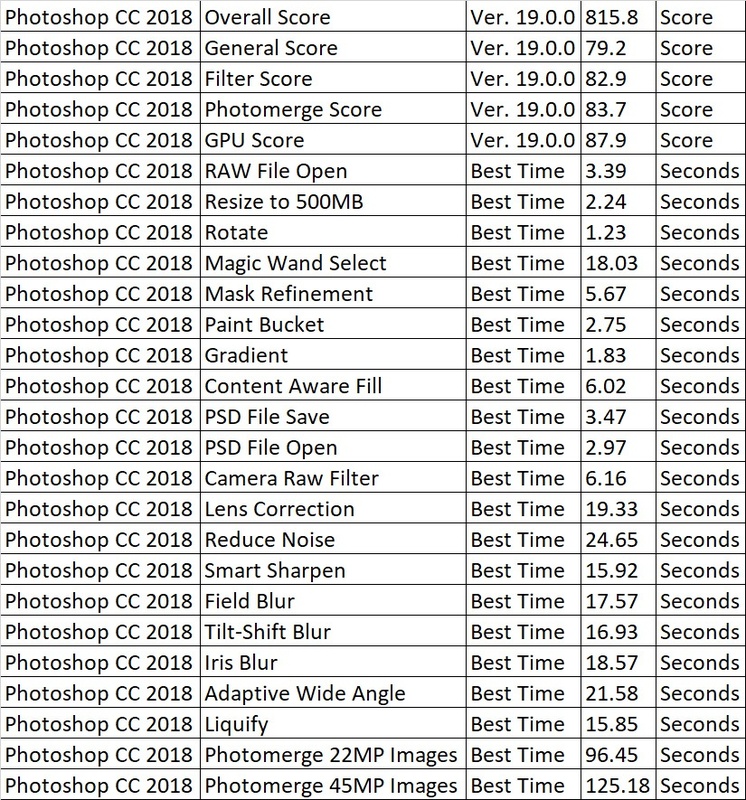 FYI, now that Photoshop CC 2019 is out, the benchmarking test script is broken. Yea, I'll get that updated. I'm not surprised the new version doesn't work, although you could try launching the script directly though "File -> Scripts -> Browse"
Upgraded my GPU, and got some new results. Matt, any chance you can test preview generation time in Bridge? A few of us still use this for library management rather than LR's all-in-one approach. My 7700K is maxed out at 90%+ when I view a new folder of photos for the duration of the preview builds, I'm very curious if this would scale on a CPU with more cores. Thanks! Hey there, did anybody run this benchmark on a Razer blade 15 (2018)? I am Curious to see the result. About to pull the trigger on a new machine to replace my ancient but trusty 2010 MacPro, which i use for high-end Photoshop work. I'd really prefer to keep using OSX, but i'm finally fed up with waiting on Apple to get their you know what together. Below are my results from my latest run. Not bad considering it's not an i9, I think. Thanks for Puget for this benchmark suite. It really helps find the slow spots in the system! Thanks for lots of very useful articles and information! Can somebody please explain exactly what the "Resize to 500MB" benchmark is doing? What is the original file type/size/resolution and what is the output file type? Is this like converting a RAW to a "smaller" JPEG? Just trying to figure out if this is a real world operation that I may do daily. What that test does is enlarge the document (which has a single layer with a RAW image on it) in order to make it a 500MB document. Resizing is a very common task which is one reason we benchmark it, but it also makes the following tasks take longer which increases the accuracy of the benchmark results. Just as a reference, it is resizing the original document from 5184x3456 to 16191x10794. That is roughly a 3x increase in size, but it is really an arbitrary dimension that simply results in a nice round 500MB document. When the 9900k is 1000 points, then the 2700x with FlareX 3200MHz CL14 RAM is a very good buy. Thanks for putting the work in on this benchmark. It helped me to make a couple decisions. Quick question though. I started the benchmark on two systems at the exact same time. One of them finished almost 2 minutes quicker than the other but the one that was slower had a higher overall score, is that expected behavior? Its completely possible. Most of the scores are simply an average of the relative performance (but not the raw seconds) of each task within that category. So if one system is faster at a task that takes a long time to complete, but the other is faster at a bunch of shorter tasks, the first system could still get a lower overall score even though the total benchmark time was shorter. https://uploads.disquscdn.c... A really useful tool that gives meaningful comparisons, not only between systems but also to compare modifications to your own setup. 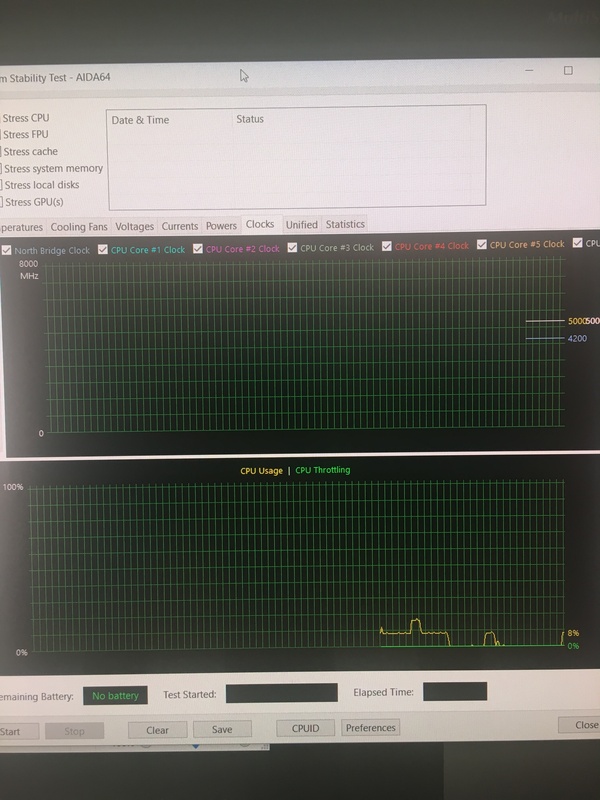 I tried it with my own, an i9900K cpu with 32Gb 3000Mhz Ram, Samsung 970 Evo plus NVME M.2 SSD, still using the onboard Video at the moment (TRX2060 next week) and got these pretty reasonable results. 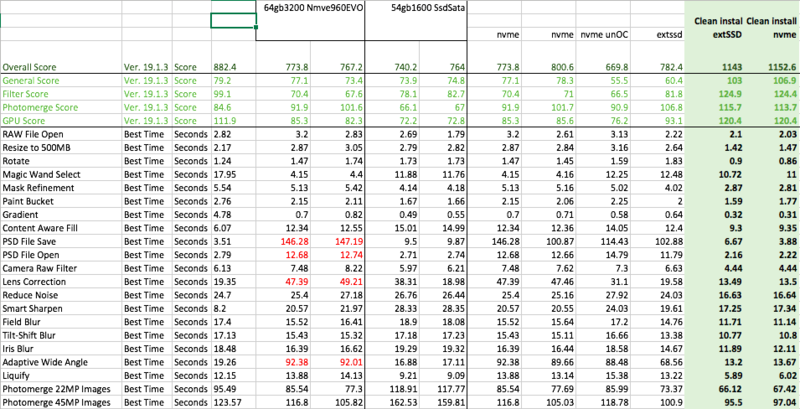 A really useful tool, not only to compare between systems but also to check whether modifications were worthwhile. Thanks! The new comp is an i9 9900K 32Gb 3000 Mhz RAM and Samsung Evo Plus NVME M.2 SSD. Still using the onboard video but it will gain an RTX2060 next week.